These next two illustrate the variety of aprons I buy. What can I say? I’m attracted to color and simple form. No matter how lovely, there is always room for improvement. I am always on the look-out for great linens and kitchen textiles, like aprons, that are calling out for a little something extra. The orange apron has already gone to live in Toronto. I know it will be very happy there. 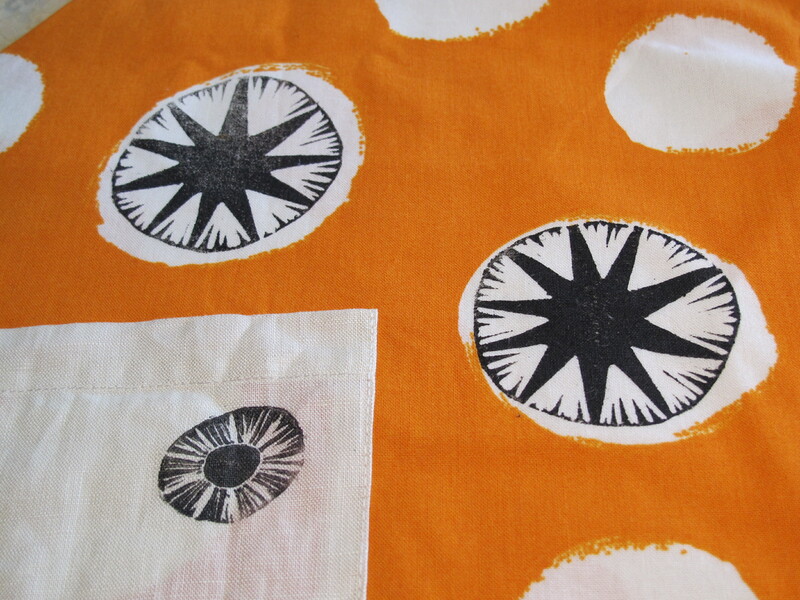 I’ve just ordered a supply of textile inks so expect to see more fabric prints in the future. I’m anxious to get busy! Next frida you are looking good! I particularly like the orange apron, Terri! Coolio! Hey thanks for the like on my blog, you have a great blog. Thank you! I’ll be checking out your blog too. Thanks! I’ll be checking out your blog too. Busy cleaning up some printing mess right now, but I’ll take a look later. Thanks for taking time to comment. You’re welcome. Isn’t it fun to have FUN! I like your printing , Terri. I like your beautiful prints.It is a very good hobby I know. Thanks. I think it’s going to be fun! I’ve been wanting to carve stamps for a long time now. We did it in art class many years ago. I was never extremely good at anything I did in there, but I loved that class. 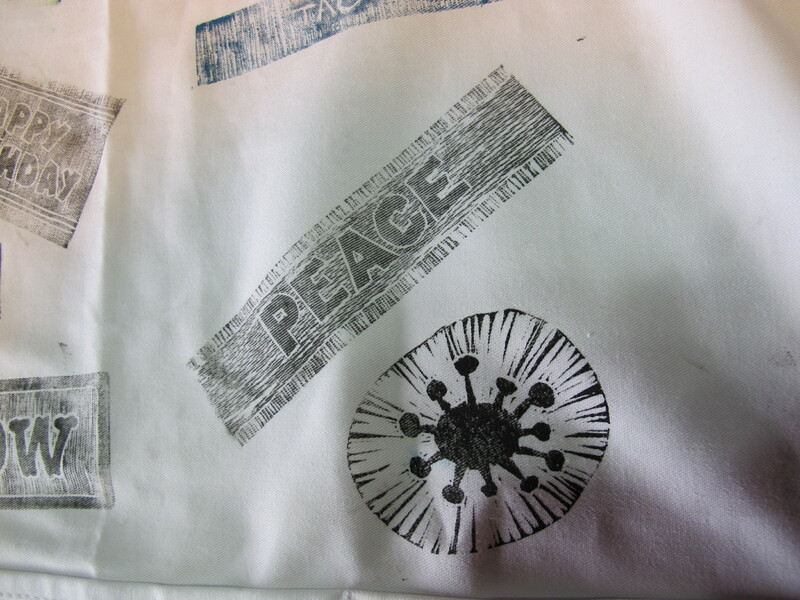 Thanks for showing me what else I can do with stamps! I’m having a great time with the carving and I doubt I’ll ever run out of ideas. 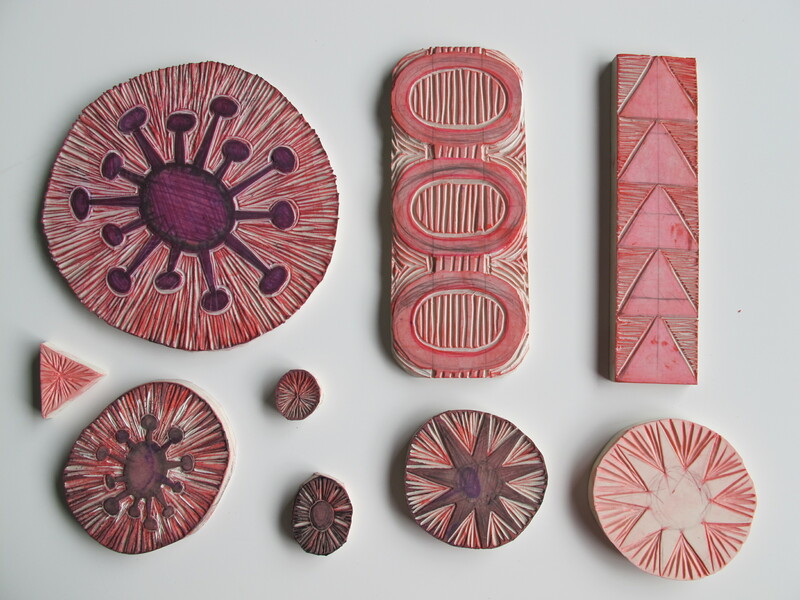 The tools required are minimal and the carving materials available now are wonderful to work with. You should give it a try. Dammit, you can carve! 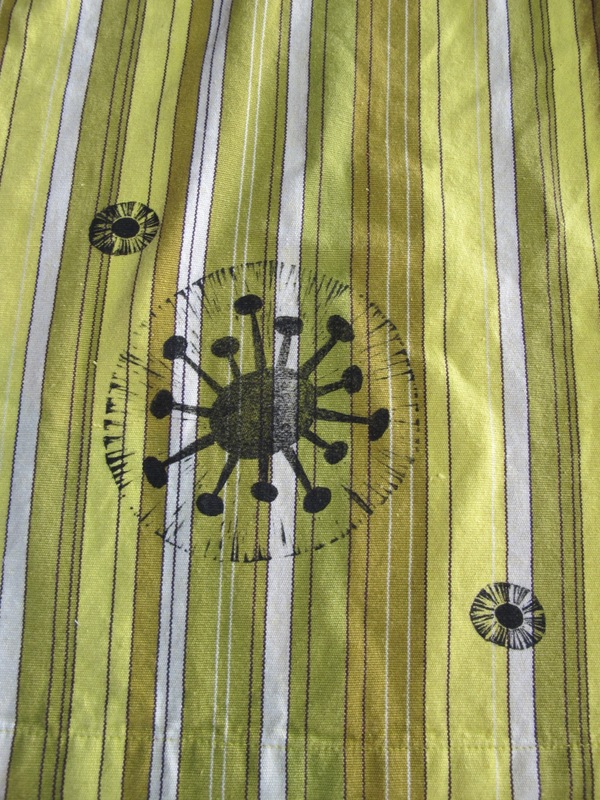 Was the mid-century style intentional? Thank you! I had no style in mind. I just start sketching and see what develops. I was carving again today and I always wonder where the ideas come from! Thanks again. These aprons look great! 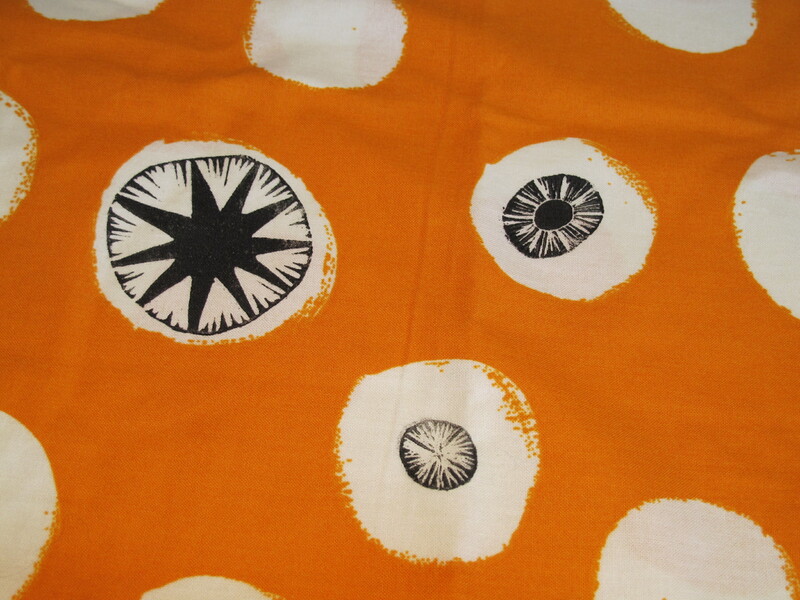 I’m with Linda; I like the orange one — or basically colors; I’d prefer black to white. The lemon-line-mustard color stripe one is nice, too. Possibly you should consider marketing them someplace like Etsy, or is that an insane suggestion? Hey, holiday season is coming. It is August after all; almost ten minutes away from Xmas decorations in the department stores. I would like to start marketing some things – cards, linens, whatever, but feel like I need a little better inventory before I take the plunge. Thanks for the encouragement! I hear you. I think you might be onto something. I adore this (especially the orange one)! Why hasn’t this occurred to me before? 🙂 Thanks for the inspiring post. Did you use actual fabric paints for the more permanent ones? Terri, you and I just may need to get together in studio one day for a mutual play date! I’m keen to play anytime! 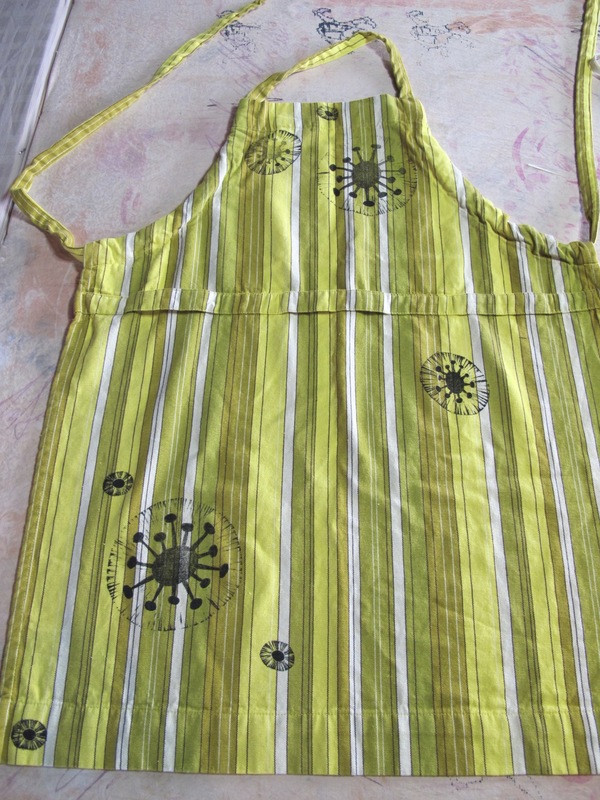 Yes, the aprons were done with textile ink. I’ve asked my friend to keep me informed as to how it stands up in the wash. I’m keeping my fingers crossed. Glad you had a good creative week-end too! 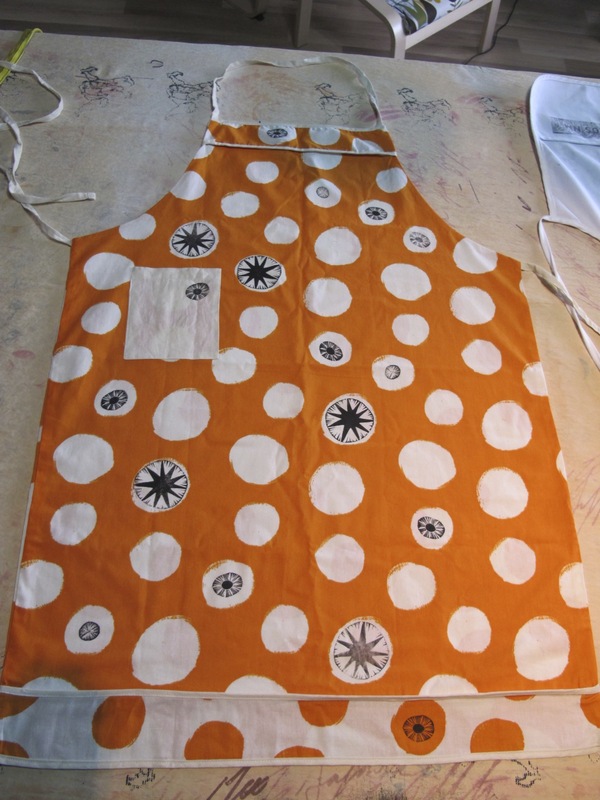 How can the orange apron be anything but happy in TO – so much fun to begin with and now even more yummy all dolled up. Can’t wait to see this new direction unfold…. Thanks. I’m looking forward to studio playtime together, since we can walk over from your house! Ahhh Terri, You have such a touch for art…and you know when to stop! 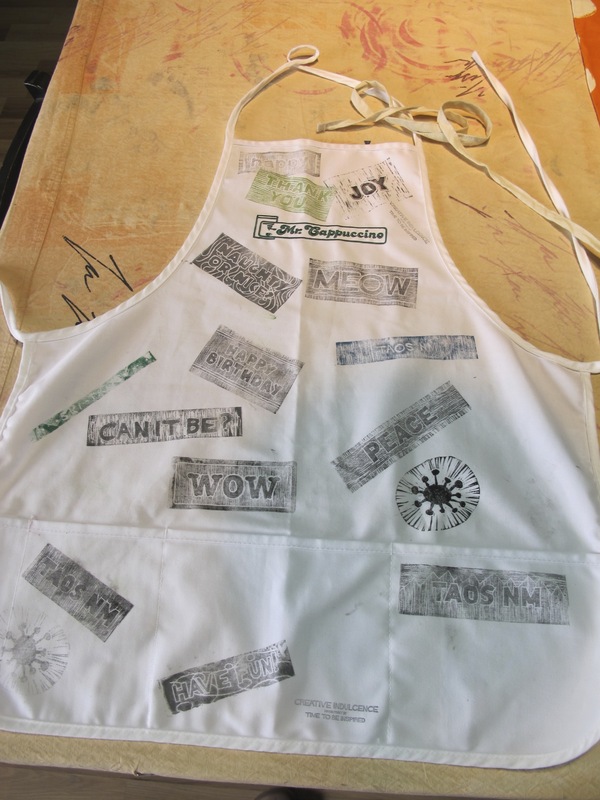 The printing on the aprons is just right. Thanks. It was so much fun I can’t wait for the rest of the inks to arrive!